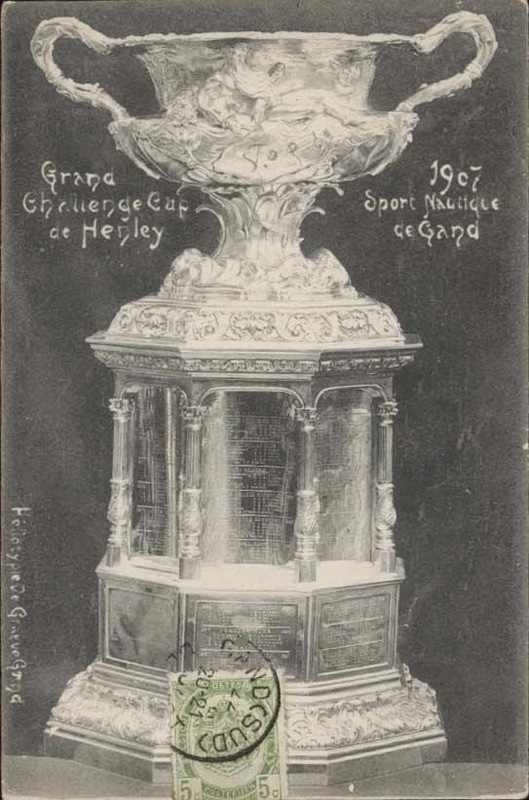 Postcard correctly identifying the 1907 winners of The Grand Challenge Cup. Hercule Poirot is in his office sitting at his desk. In front of him is a strange contraption at which he is staring. It is the latest computer, the RAM-ING Speed 4X. There is a knock on the door. Poirot: Come in, Come in. Hastings enters and is surprised with Poirot’s demeanour. Hastings: What’s the matter Poirot? Are you okay? Poirot: Nothing is the matter mon ami, quite the contrary. Come and see this … this thing on my new computer. It is a ‘blog’ called ‘Ear Ze Boat Sing. I have been working all night to help these poor fellows identify the first ‘Vainqueurs’ whom I am proud to call ‘mes collègues Belges’. Hastings: Are you sure you are okay Poirot? Poirot: Ah, my little English friend – I see you are still upset about the results of Le Grand Challenge Cups of 1906, 1907 and 1909. Now, let me tell you what I have found out about ‘Les Braves Belges’. 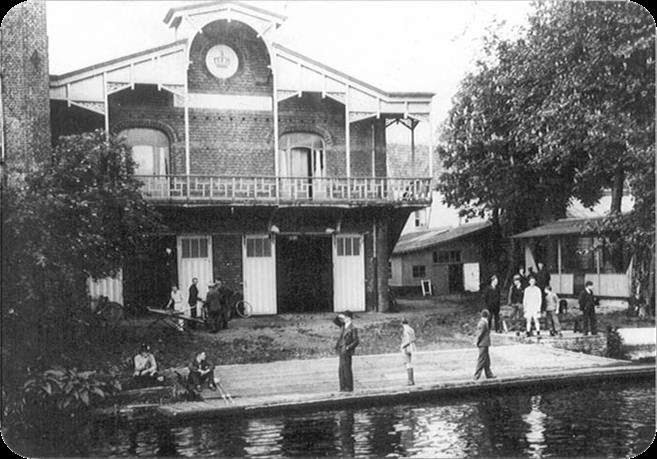 Sport Nautique de Gand boathouse from 1906 to c.1960. According to my good friend Jan Martens, one of Ghent’s rowing clubs was founded in 1883 as Sport Nautique de Gand (SNG). 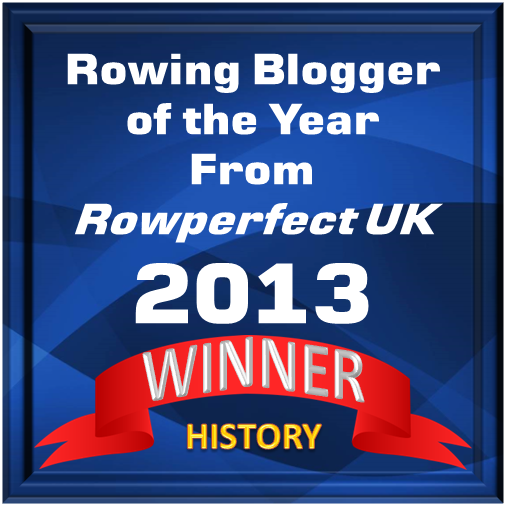 The club started out modestly but four years later was a founding member of the Belgian Rowing Federation (BRF). In 1898, their first flag, in their new colours of blue and white, was presented to the club (the initial club colours were black and white). 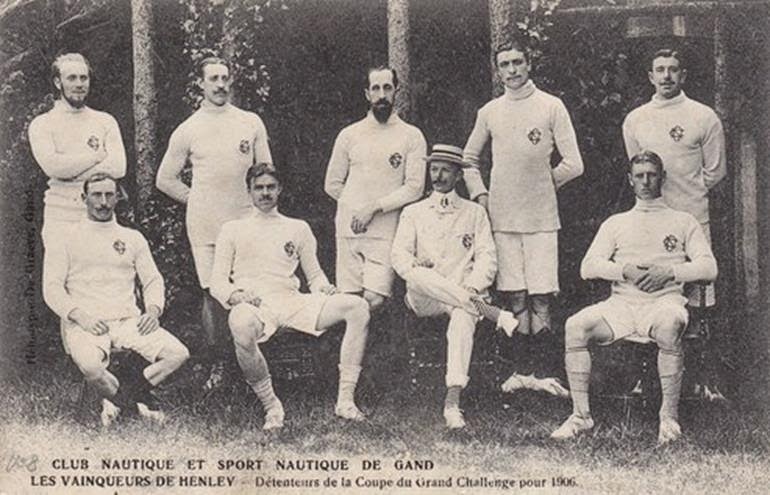 Two years later a different flag, light blue with white lettering “Sport Nautique de Gand 1883” was adopted at the request of the BRF in order to differentiate the club from the local Cercle des Régates. Around 1890 SNG had become the foremost rowing club in Belgium and international successes would follow. A royal appellation was granted in 1907 after a resounding victory at Henley. 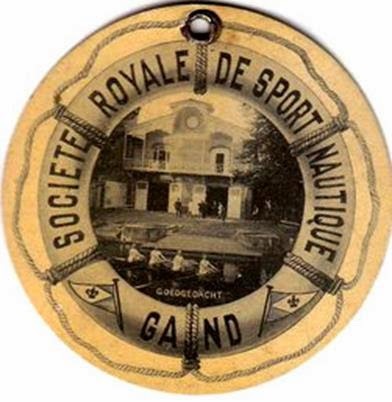 Use of the French language was a sign of the times and the club became ‘Société Royale de Sport Nautique de Gand’. After the Second World War, the club was active in promoting the Watersportbaan, finished and dedicated in 1955. In 1964, a new name was adopted, Koninklijke Roeivereniging “Sport Nautique” Gent, and put on the new flag presented in 1971; three years later, the current name, Koninklijke Roeivereniging Sport Gent, now completely in Flemish, was introduced. And yes Hastings… I have found photographs of these fine fellows, take a look. What a beautiful moustache has Monsieur Van der Waerden. 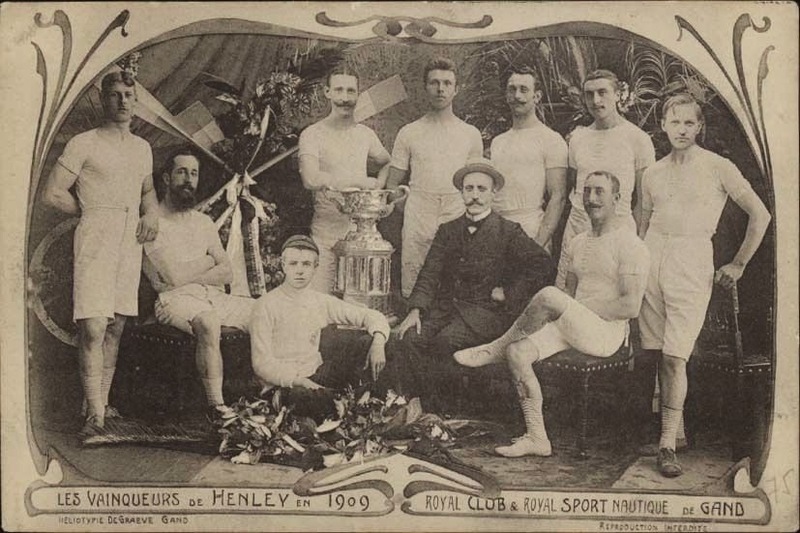 Winners of the Grand Challenge Cup 1906. Official result of the final: Club Nautique de Gand, Belgium, beat Trinity Hall, Cambridge, by three lengths – time 7 minutes, 9 seconds. Above is another photograph of the 1906 ‘Grand’ winning crew. Was this really a composite crew of ‘Club Nautique’ and ‘Sport Nautique’ as the postcards suggests? Winners of the Grand Challenge Cup 1907. Official result of the final: Sport Nautique de Gand, Belgium, beat Christ Church, Oxford, by one length – time 7 minutes, 31 seconds. Équipage: P. de Geyter, Guillaume Visser, Urbain Molmans, Alphonse Van Roy, François Vergucht, Polydore Veirman, Oscar de Somville, Rodolphe Poma (stroke), Rodolphe Colpaert (cox). 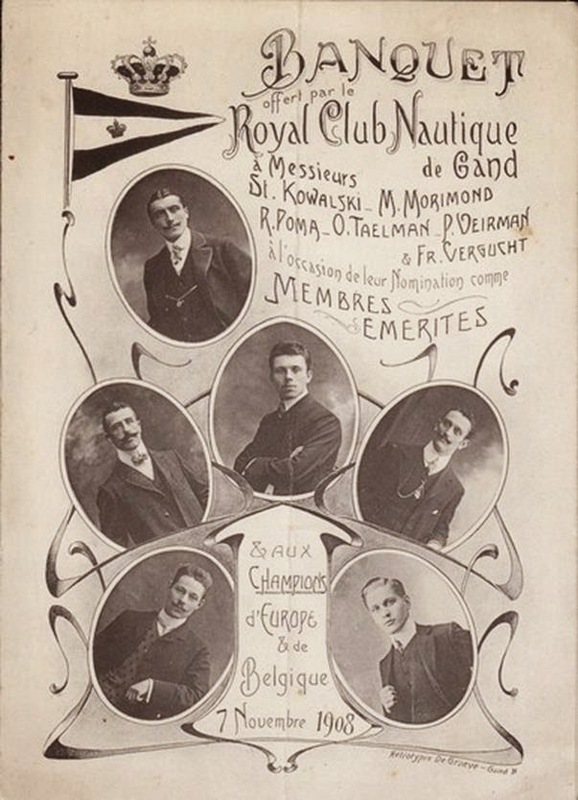 Despite the official result, this postcard gives the 1907 winners as Sport Nautique & Royal Club Nautique de Gand. The royal appellation applying to the official winning club from the previous year. Two postcards with the winners of the Grand Challenge Cup 1909. Official result of the final: Royal Club Nautique de Gand, Belgium, beat Jesus College, Cambridge, by one length – time 7 minutes, 8 seconds. Équipage: Urbain Molmans, Guillaume Visser, St. Kowalski, Réme Orban, François Vergucht, Polydore Veirman, Oscar de Somville, Rodolphe Poma (stroke), Alfred van Landeghem (cox). Both these postcards identify the 1909 vainqueurs as Royal Club Nautique & Royal Sport Nautique de Gand, the royal appellation now applying to both clubs. The Ghent Eight were led by the dominant international sweep rowers of their day, Guillaume Visser and Urbain Molmans. Before rowing 4 and bow in the winning Grand Challenge Cup Eight at Henley in 1906, Visser and Molmans had rowed to Gold in the coxed-pairs, coxed-fours and eights at the European Championships in 1903, Silver in the coxed-pairs and Gold in the coxed-fours and eights in 1904, along with Gold in the coxed-pairs and coxed-fours and Silver in the eights in 1905. So, Hastings you can see that there is a mystery to be solved. Hastings: What mystery is that exactly, Poirot? 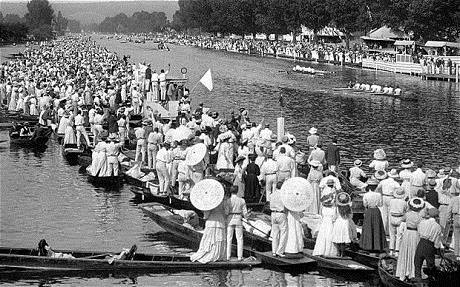 Poirot: It was not until 1970 that the venerable Stewards of Henley Royal Regatta changed the rules to allow composites to compete in the Grand Challenge Cup. Did the equally venerable gentlemen of Ghent find a way around this rule? I think so. You see Hastings, Visser and Molmans were docks foremen and members of Sport Nautique de Gand. Hastings: I say Poirot, that’s just not cricket! Poirot: Perhaps not Hastings, but I do not think a crime has been committed because in 1906 they must also have been members of Club Nautique de Gand – at least for HRR entry purposes. And, of course, in the following year the entry was made in the name of Sport Nautique de Gand. And yet again, in 1909, the Ghent entry was back in the name of Club Nautique de Gand, which by then was ‘Royal Club Nautique de Gand’. The photographs and postcards do not lie but they do not tell the whole truth. Hastings: Of course! They rowed under ‘a flag of convenience’. But what happened to them in 1908? I know that the Stewards introduced a rule change excluding overseas entries from the regatta that year owing to the Olympic Regatta being held in Henley in mid-July. Surely, they represented Belgium at the Olympics? Poirot: Ah! Hastings, is that the time? I must leave straight away for a meeting with Chief Inspector Japp. Perhaps another time, yes? Au revoir. Hastings (an old Etonian) is determined to find out what happened in Henley-on-Thames at the 1908 Olympic Regatta and decides to use Poirot’s computer. Initially he is foiled by the demand for a password, but eventually he types in felicity4me and sure enough it works! He finds that Great Britain was represented by Cambridge University BC and Leander Club, and it was the latter that beat Belgium, represented by Royal Club Nautique de Gand, to win the gold medal in the eights. Great Britain leads Belgium over the finish line to win gold at the 1908 Olympic Games in Henley-on-Thames. There are reports on all the eights’ races at the 1908 Games here. The 1908 Belgian crew was Oscar Taelman, Marcel Morimont, Rémy Orban, Georges Mijs, François Vergucht, Polydore Veirman, Oscar De Somville, Rodolphe Poma, Alfred van Landeghem (cox). 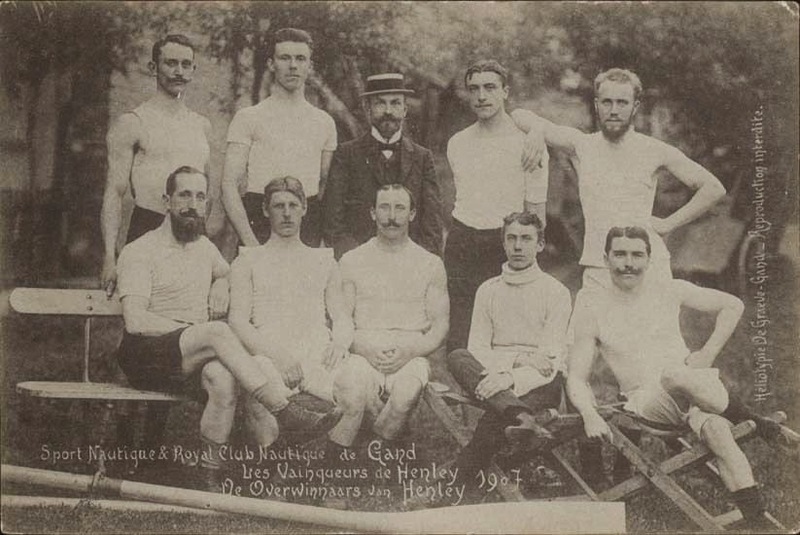 An analysis the Belgian crews who raced at Henley between 1906 and 1909 prove that ‘Club de Gand’, ‘Sport de Gand’ and the ‘Belgian Olympic eight’ bore remarkable similarities. 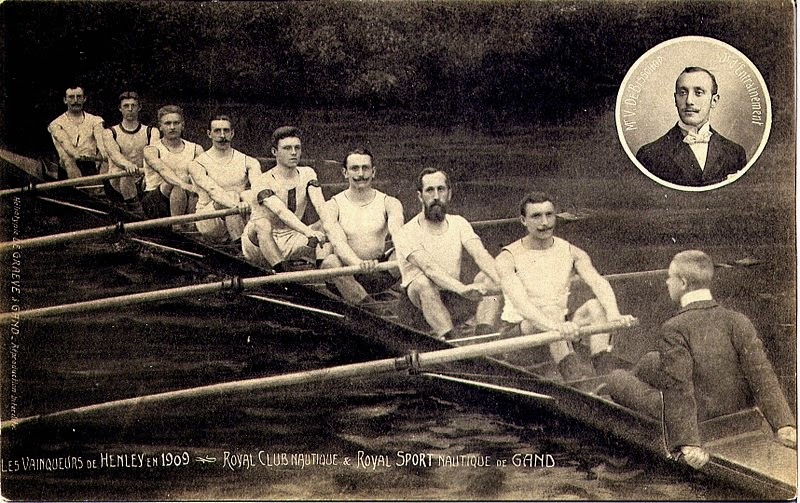 Of the 15 rowers used in the four years, seven men raced in three or more years, while Oscar De Somville (7) and Rodolphe Poma (stroke) raced in all four years. It is also noteworthy that De Somville and van Landeghem were Olympic silver medallist in the eights in the Paris Games in 1900. 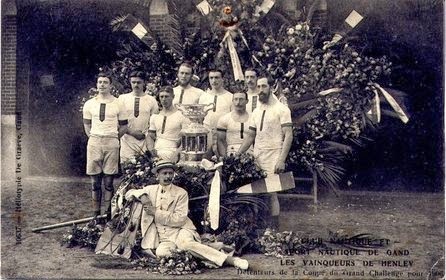 The defeat of the Belgians in the final of the Olympics, which earned several of their members a silver medal, did not merit a mention on the menu of the Banquet held by Royal Club Nautique de Gand to celebrate the club’s achievements during the 1908 season. Six men were elected as ‘membres emerites’ and from this we can identify that Messrs Kowalski, Morimond, Poma, Taelman, Veirman and Vergucht were ‘Club’ men. 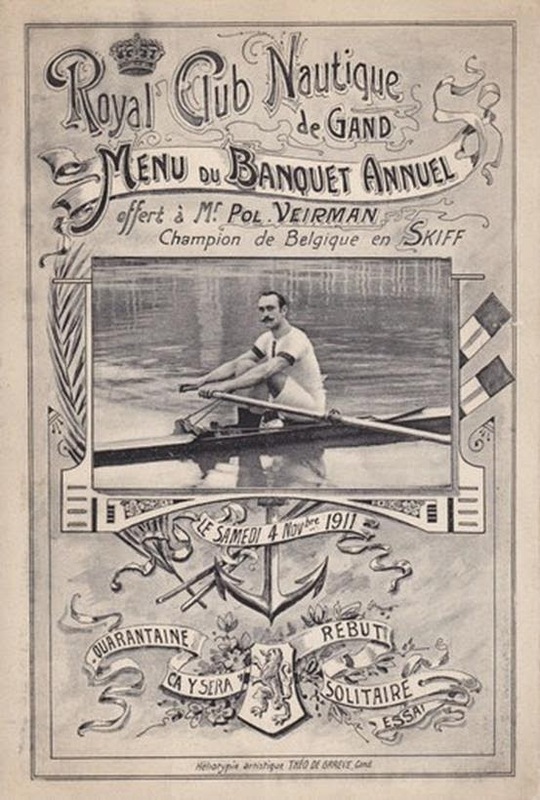 Polydore Veirman, the six-man of the 1907, 1908 and 1909 crews featured on the cover of the 1911 menu after claiming the sculling championship of Belgium. He also took a silver medal in the single sculls at the 1912 Olympic rowing in Stockholm. Poirot never found out that Hastings had cracked his computer! Great research on a classic puzzler. Formidable, mes amis! they couldn’t have been Grand-er. or was one a bit Gand-er?